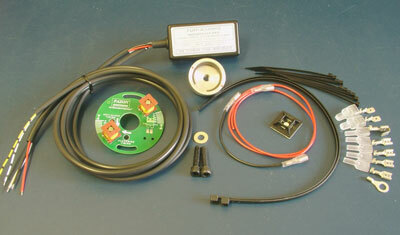 For Norton Jubilee/Electra/Navigator, see kit PA2L. Felt I needed to tell you. After weeks of mucking around trying to get my 68 Bonneville to run right (was fitted with a ***** system by the way) I purchased one of your sure-fire units. After I completed installation I gave it a half kick and it fired up and settled into a steady idle (never done that before) I could not believe how much better the bike started, idled and performed. The throttle response is a whole lot better too. Feel free to use this as a reference. 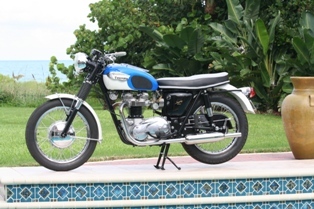 "Found in a barn and rebuilt from scratch"
Let me introduce myself, My name is Larry Louton from Venice, Florida, Master Jaguar Technician for Jaguar of Sarasota and proud owner of a 1966 Triumph TR6SR with your ignition system. Product code PA2. I found this bike in a barn of a house I bought in 1999. The bare frame was on a bench and the motor was laying on it's side in the dirt. The owner of the house gave me the pieces as described as part of the sale of the house. All other components had to be found as finances allowed which leads to why I started with the ***** Mark III system. Wanting the reliability of a electronic ignition system, I purchased the ***** system from Map Cycle of St. Pete, Florida in the year 2000. Move forward about five years and I have managed to assemble the bike from scratch. Amongst the bike's teething troubles was that no matter what I did about timing the ***** unit it simply would not advance or perhaps it was simply stuck on full advance. Hence a horrible lack of power. The other problem with the ***** unit was the reliability that I was looking for wasn't there, even on short mile long trips, the ignition system would quit, I would wait five minutes, rekick and go for about another mile. I called Map Cycle asking for warranty on the system, and they lamented with me that they no longer carried the ***** system due to reliability problems and I was simply out of the warranty because the five year policy had gone away while my new ***** system had expired while sitting on a shelf in my garage used or unused. The good news was that they now carried a new system which carried the name PAZON. They claimed to have seen perfect reliability and none of the tuning problems. So I bought and in about an hour rewired the ignition system with your unit and never looked back. Loved the twelve pages of instructions and the proper wiring schematic in color!! Tuning tips that work?? The box itself is small enough to hide under the fuel tank just above the coils. Made for a real neat wiring project. Trust me, when you get it right and the hair stands up on your neck during that first to second gear shift, you will feel invinceable. Hang a wheelstand for yourself. All my hats off to Pazon, ***** still has something to learn about their loss. You may use my name, anything I have said to promote your product. 10,000 percent endorsement. Please note that the bike you are about to see is also equipped with 3/4 race cams, lightened flywheels and a 17 tooth front sprocket. It will carry a wheelie for the first three gears and then I run out of courage in fourth. We don't feel the need to mention our competitors by name as our products stand on their own merits. First let me thank you for the advice and your prompt response. I fitted the trigger module in between the frame tubes under the petrol tank. I found that fitting the electronic ignition was very easy and I was able to take out all the original parts and store them away just in case I sell the machine, this would allow the buyer to restore the bike to as manufactured, not that I would want to as I noticed the difference the first time I started the bike up, the bike ran much more smoothly (even at very low revs) where there was always a slight miss fire. I took the bike out on Monday night (club night) to see how it ran, after fitting the ignition out of the box and setting the timing statically, I found the timing to be just a bit advanced and I had set the tick over too slow. Today was mot day for the bike and a good chance to set the timing with a strobe light, but the sun was too strong and I could not see the timing dots so I set it by eye (I guess that it was advanced by about 3 - 5 deg), this adjusted and the tick over it ran like a dream. I thought I would mention that this ignition system is fitted to a 1966 BSA Royal Star.